For the Fourth of July and many other occasions, a patriotic kid's hat is an indispensable accessory. Regardless of your child's style wishes, there is a type of patriotic hat that's perfect for him or her. What's more, making your own patriotic hat is a fun activity, providing hours of fun as well as the sense of pride kids have when wearing something they created themselves. From baseball caps to patterned top hats, patriotic hats can be found in many different styles. Many styles come in kids' sizes as well as adult sizes. 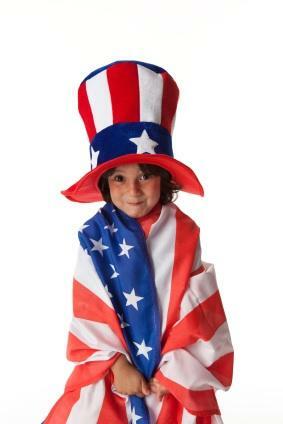 U.S. Toy Company offers a wide selection of several different styles of patriotic hats. From derby hats to straw skimmers with a red, white, and blue band, this shop offers several styles at affordable prices. The patriotic baseball caps are also a popular choice. Some hats can be purchased by the piece while others must be purchased by the dozen. Oriental Trading has a few different types of patriotic hats available, some of which are available in children's sizes. For example, the child's straw hat with a star on the front is a stylish patriotic hat. Choose from blue with a red star or red with a blue star; this hat is sure to please children who appreciate western clothing and accessory styles. Windy City Novelties offers several patriotic hats, including the popular stars and stripes top hat called the "Uncle Sam" hat. This company has many featured patriotic hats, not to mention several other types of accessories that can complement a patriotic hat, such as bandannas. While several patriotic hats can be purchased, adventurous kids and caregivers may have a whole lot of fun making patriotic hats themselves, not to mention save on costs if you need several hats. Fabric markers and pens to draw stars and/or stripes, as well as perhaps write a patriotic slogan on the hat. Iron-on flags or stars, or patches to sew on a baseball cap or other textile hat. Stars and stripes ribbons can be used to make a single band around the rim of a top hat or straw hat, or, for girls, make two ribbons hanging down from the hat that can be tied under the chin like a bonnet. Tie-dye creates a unique look. Use a white baseball cap or other textile hat to tie-dye or splotch paint in patriotic colors. Use glitter glue to add stars or slogans to any type of hat. Making patriotic kids' hats can be a whole lot of fun. Start the process at least a week before you're planning to use the hats so that you're sure the hats will be glued/dried/sewn and ready to wear long before the moment you need it. Whether an accessory for the Fourth of July, a school or church event, or simply a fun accessory your kids are interested in having, a patriotic hat can be a nice accessory and a fun activity for a rainy day if you design and make the hat yourself.